Last night, as a salute to my study of Italian wines, I headed to my kitchen to play Italian chef. The weather was nippy for Houston, in the low thirties, so I opted for one of my favorite cold weather dishes: ossobuco, or Milanese style braised veal shanks. I did a little research on ossobuco, which literally translates as “bone with a hole” and learned that I prefer a modern style of ossobuco that has tomatoes. Traditional ossobuco is braised with cinnamon, bay leaf and gremolata or a chopped mixture of lemon zest, garlic and parsley. I’ve tried several recipes through the years, but my favorite is Marcella Hazan’s which seems to be perfect every time. Ossobuco is traditionally served with Risotto Milanese, a brilliantly yellow risotto simmered with saffron. I was about to start my Risotto Milanese when I recalled the beautiful Chanterelle mushrooms that were in my refrigerator. I had found them at Costco, of all places and had used half in a wonderful Chanterelle Gruyere bread pudding the week before. So I decided to create my own risotto dish on the fly. I sautéed six or seven garlic cloves in olive oil from our property in Sinalunga (we LOVE garlic and there is nothing more fun than cooking with your very own olive oil). Then I coarsely chopped the Chanterelles and sautéed them until wilted. Then I added a cup or two of Arborio rice and stirred to let it absorb the remaining oil. I added a few cups of chicken stock, Maldon salt and about a cup of lightly chopped haricots verts (more bounty from the fridge), brought it to a boil, then reduced the heat to allow it to simmer, stirring constantly. Then I took a sip of wine (I had opened a bottle of sauvignon blanc to flavor the ossobuco and everyone knows that meals are best when the cook enjoys a glass or two in the kitchen) and pondered my new creation. It was sounding delicious, but I thought it could use a touch of texture. So I took some pignoli out of the freezer and set them in a ramekin to roast in the oven next to the ossobucco. After about twenty-five minutes, the risotto had absorbed the stock and was tender. I added about a cup of milk, a couple of cups of baby spinach leaves, the pinenuts and kept sipping my wine and stirring. When the milk was absorbed and the spinach wilted, I stirred in about half a cup of parmesan reggiano and Voila! My “Pam style”, refrigerator emptying, and DELICIOUS risotto was ready. When I set the ossobucco in the oven, I had decided to serve it with a bottle of 2005 Tignanello from Tuscany that I took from our cellar and decanted. Our wine maker was formerly part of the team that made Tignanello and it had been a while since we had a bottle. Tignanello is a “Super Tuscan”: a blend of 85% Sangiovese, 10% Cabernet Sauvignon and 5% Cabernet Franc – very similar in style to what we plan to make in the coming year. The acid in Sangiovese generally pairs wonderfully with tomato based sauces and I hoped that the duo of Cabernets in the blend would add an extra layer of interest, in complement to the veal. The wine was lovely, with a developing bouquet of cherry, chocolate and leather and a supple feel in the mouth. It continued to improve as we sipped it through the evening, so I think it could have benefited from more than the two hours that it spent in the decanter. 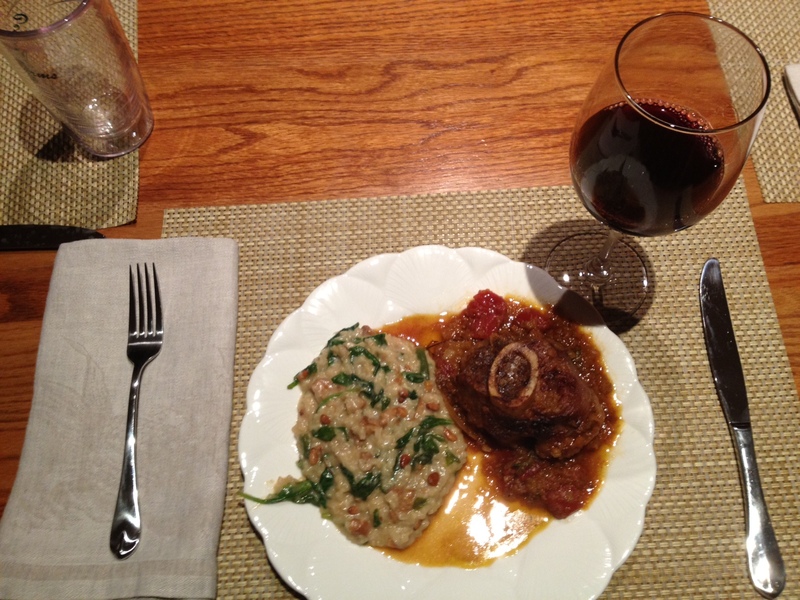 The ossobucco was as scrumptious as always and it worked so well with both my improvised risotto and the Tignanello that the meal was a wonderful success – a celebration of the season and a tribute to all I had learned about Italian wines in the previous week. Sleigh Bells Ring….Are you Listening???? Are there any leftovers? Sounds soul satisfying and perfect.